This may be my favorite piece yet! 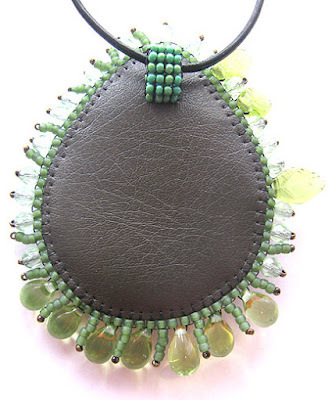 I wore it over the weekend and received many compliments, especially on the beauty of the focal piece that Jennifer West made. 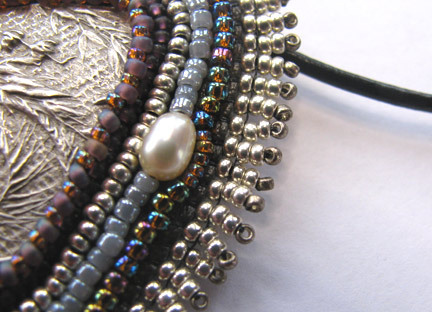 One little trick that I'll point out to you is how I back stitch around a fresh water pearl when I want the flow of beads to continue as smoothly as possible. 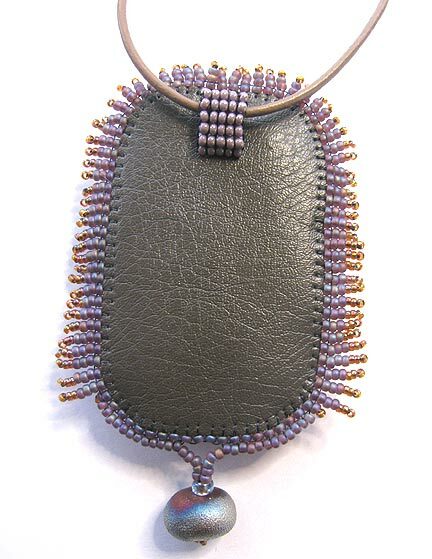 When I add the last row of back stitching and the pearls are jutting into that row, I switch from size 11/0 to size 15/0 seed beads. That means having a pretty big stash of beads, but I learned long ago that it's good to have a color you like in every size possible! 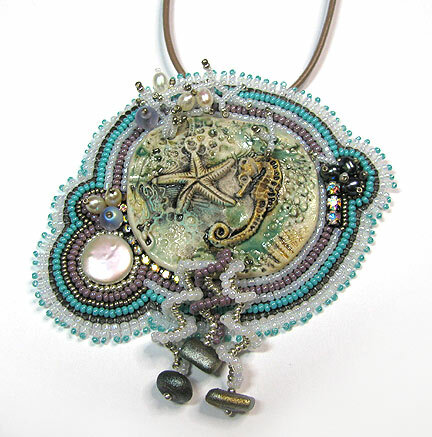 The color palette led me to use one of Amy Mealey's raku beads as a dangle at the bottom. Further instruction on making bead embroidered pieces can be found in Every Bead Has a Story, where the first chapter is free to download. The book as a whole covers all the different stitches I use, the methods for attaching the backing, bezel and bail construction, and much more. 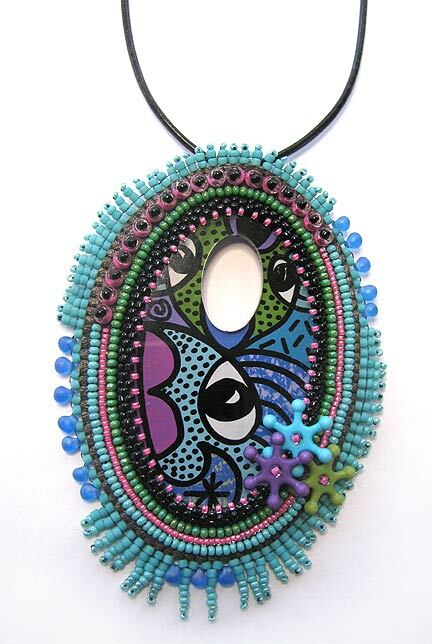 Yvonne Irvin-Faus makes these really fun focal pieces, and I just had to scoop up a few of them at her last online trunk show. 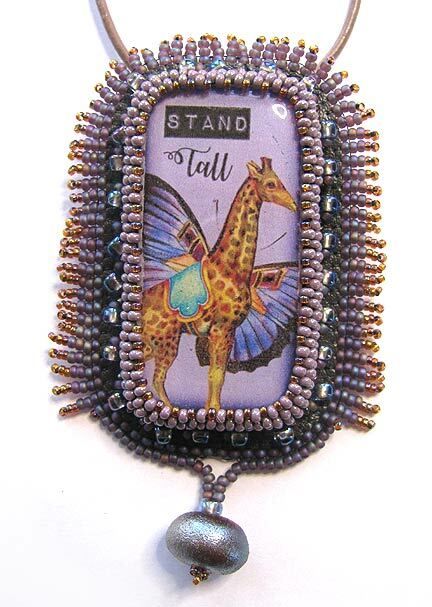 I wanted to add a few more dimensional elements in order to keep with the playful vibe of the focal, so I added some size 6/0 seed beads in short stacks, a few cute little asterisk beads that Yvonne included in my package just for fun, and some areas of drop beads around the edges. 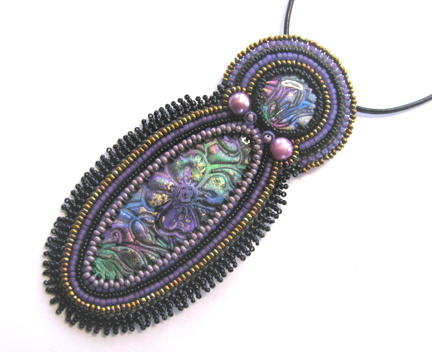 With so many colors to choose from in the focal, it was a delight to stitch this one up! I have been interested in raku work for quite some time, but only recently found a maker of beads and cabochons that I could really envision in my bead embroidered pieces. 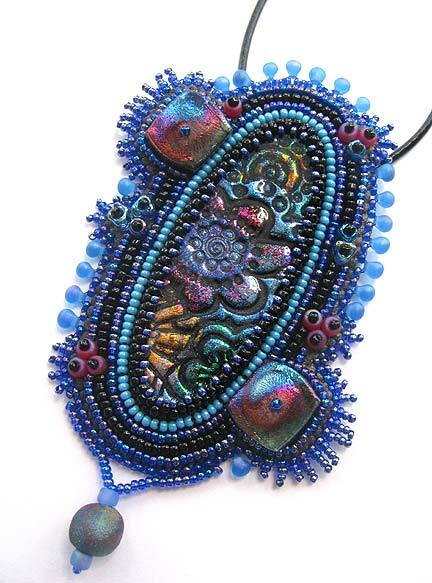 The focal and the two large beads in Moonlight were made by Amy Mealey of Xaz Bead Company. 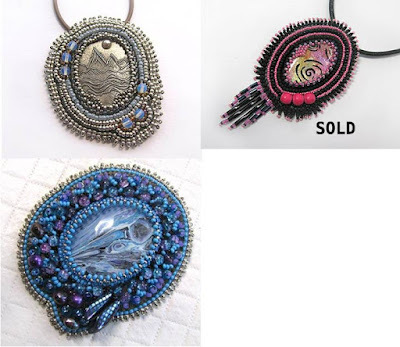 I was blessed to be able to scoop up quite a few of Amy's pieces during a recent online trunk show. 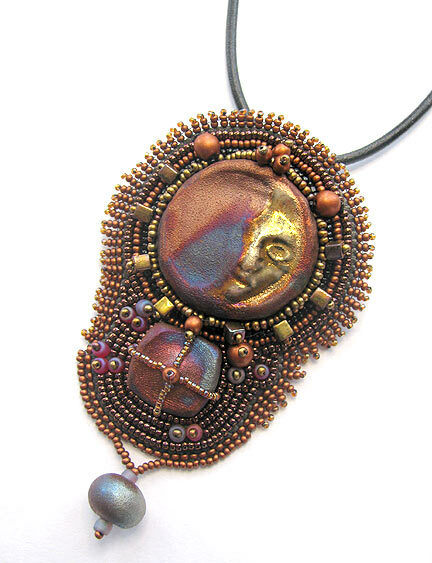 The gold and coppery flashes of raku along with the purple and teal glazes are the colors that I love the best. 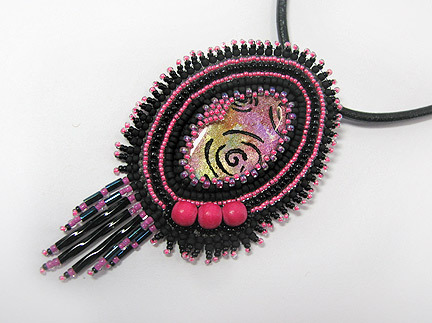 I made sure that I bought pieces in other color combos too, though! It wasn't hard...all of Amy's work is great. 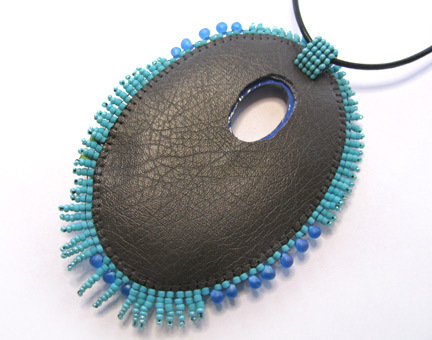 Since the beads are so eye-catching on their own, I kept the embroidery very simple, with a slightly decorated peyote bezel, lots of back stitch, and some double bead stacks. 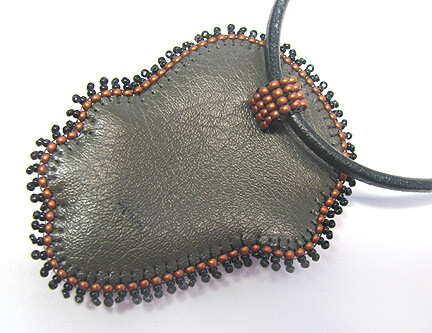 The edges are all finished with edging brick stitch, stack stitches on the upper 3/4s, and strands of seed beads leading to a dangling raku bead on the bottom 1/4. 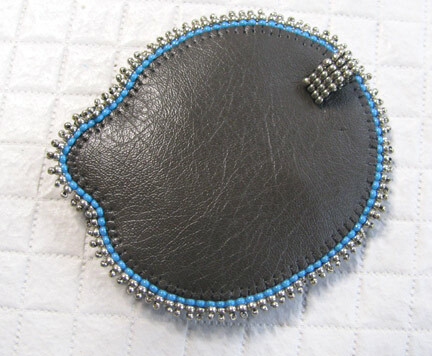 The back has the usual square stitch bail for hanging. 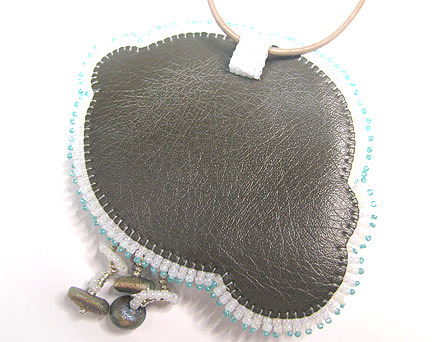 This is a heavy pendant, so I stitched right through all the layers to anchor the bail, hiding the stitches on top in the beadwork. 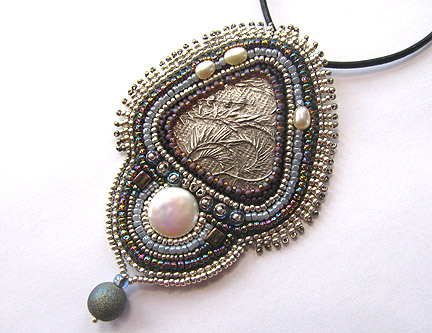 The center is another of the beautiful designs I bought from Jennifer West during her trunk show. 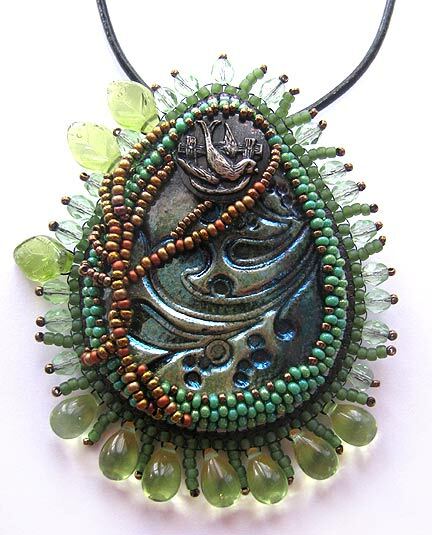 I just love her work so much, and each unique piece is inspiring me to think of a different bead design to show it off. 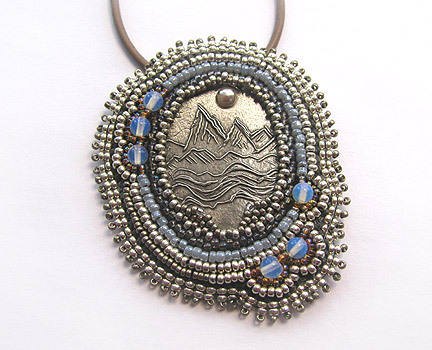 I really enjoyed stitching up the bezel for this one...do you see the little beaded "mountain peaks" at the bottom of the cabochon? 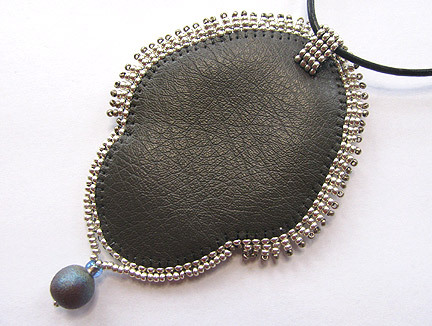 The piece had a hole in it, which was just begging to be filled by a pearl "moon". 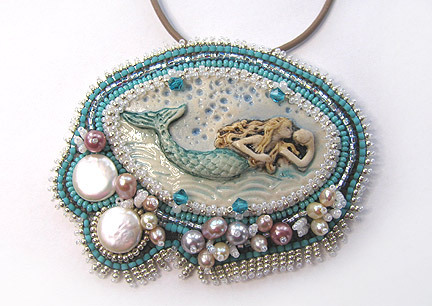 I fell in love with this mermaid that my friend Sheri Mallery made, and I decided that she would be the centerpiece of my next pendant. Along with back stitch, I used some varied lengths of stack stitch (similar to fringe, but on the surface rather than the edges) and pearls to go with the seashore theme. 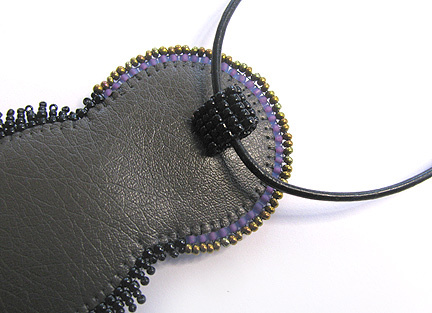 The bezel uses a right angle weave edging, and some "corner" accents that are both taught in my e-book Some Assembly Required. 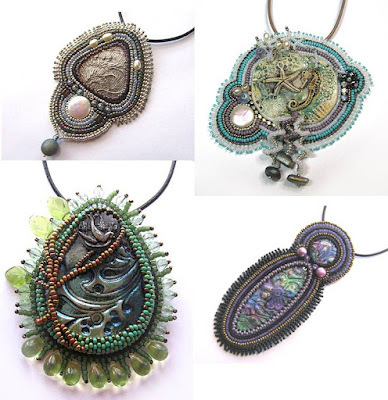 SAR covers making different types of bezels to enhance both regularly shaped and irregularly shaped cabochons, connecting your bead embroidered components with various techniques, unifying your piece with texture, and creating beautiful finishing styles. I recently bought some of these polymer clay cabochons from Mary Anne Williams Knapp at her online trunk show. 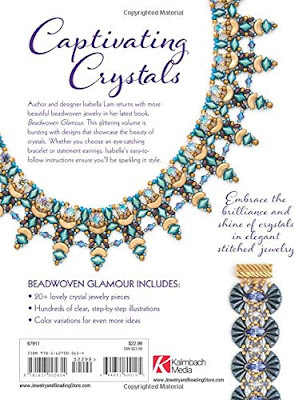 The colors are wonderful and there's a lot of depth to the designs, even though they are flat rather than domed. I didn't mind the lack of doming at all...in fact, it allowed me to add fewer rows of peyote in order to get to the top of the cab. 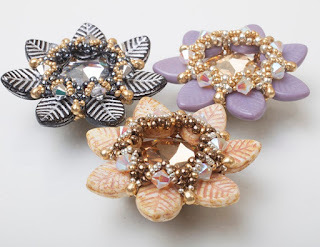 Once there, I decided to fool around a bit with a decorative flourish. Do you like it? 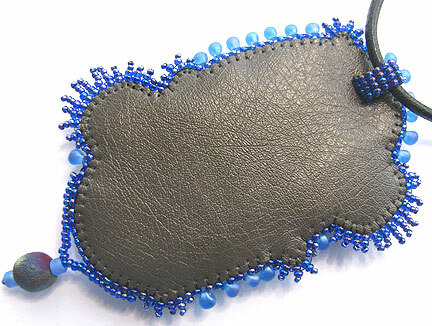 It's simply some additional peyote done with size 15/0 seed beads. 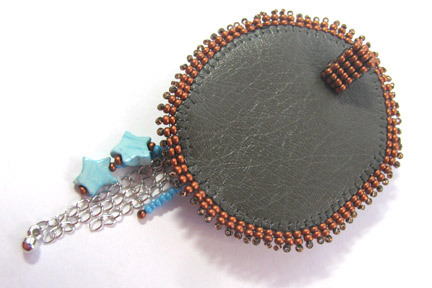 I'm planning on playing with this idea more and getting more elaborate, but on a plainer cabochon! 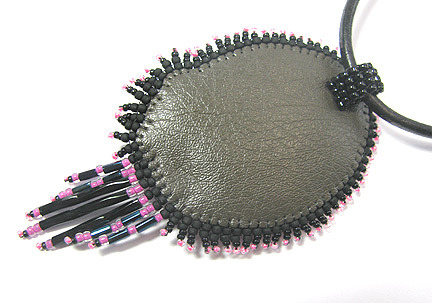 If you've never added fringe to your pieces, it's really easy. 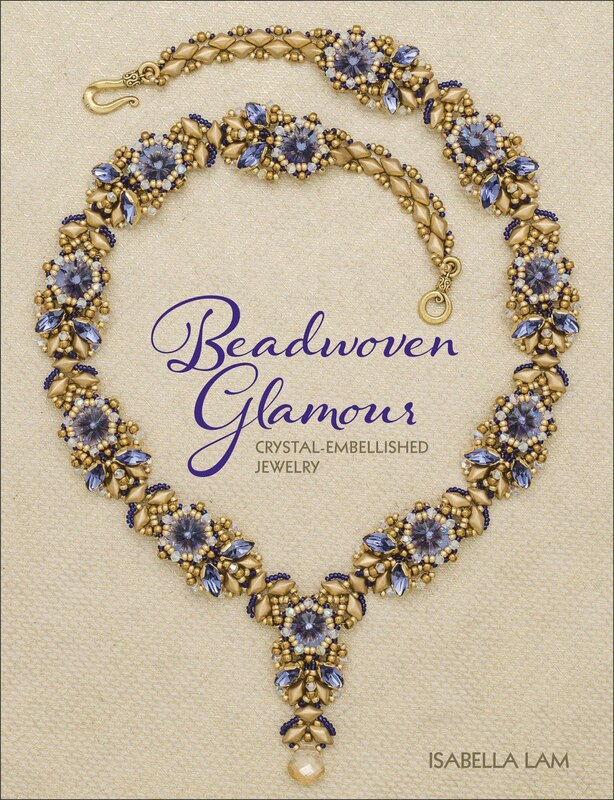 I show you how to do it with over-sized beads and lots of pictures in the free first chapter of my e-book Every Bead Has a Story. 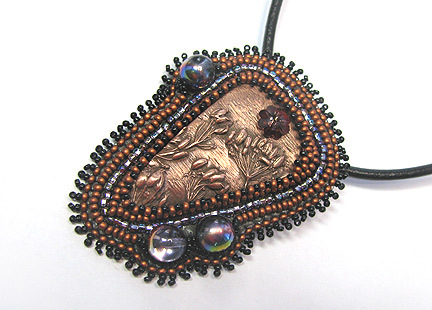 The centerpiece of this pendant is a copper clay beauty that I bought from Jennifer West. 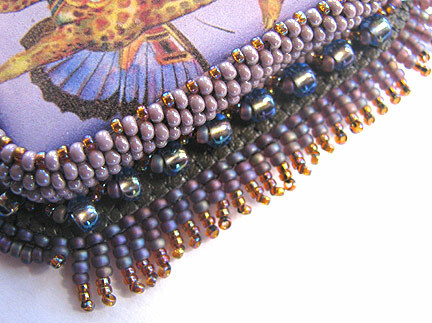 I have FIVE more of her pieces, so the metallic fun will continue! 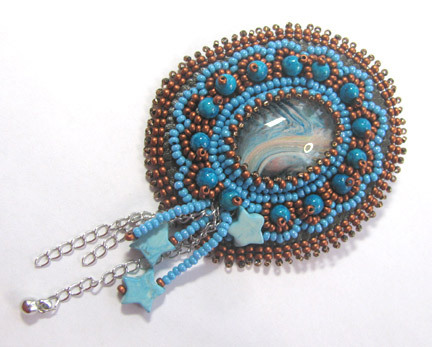 I'm planning on doing some more elaborate bezeling on some of the other pieces. 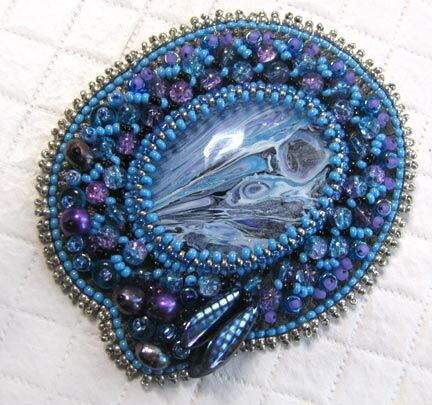 This is the second painted glass cabochon that I bought from my friend Lea Avroch. 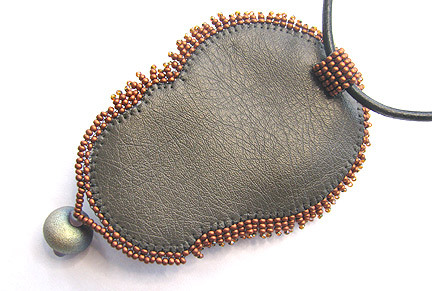 I highly recommend her work if you are looking for one-of-a-kind pieces to use in your bead embroidery, and no, she didn't pay me to say that :-) I have some leather and leather-look necklaces on the way to use as neck straps for some of these pendants that I've been making. I think I'm going to look into selling some of them, because they are starting to pile up!